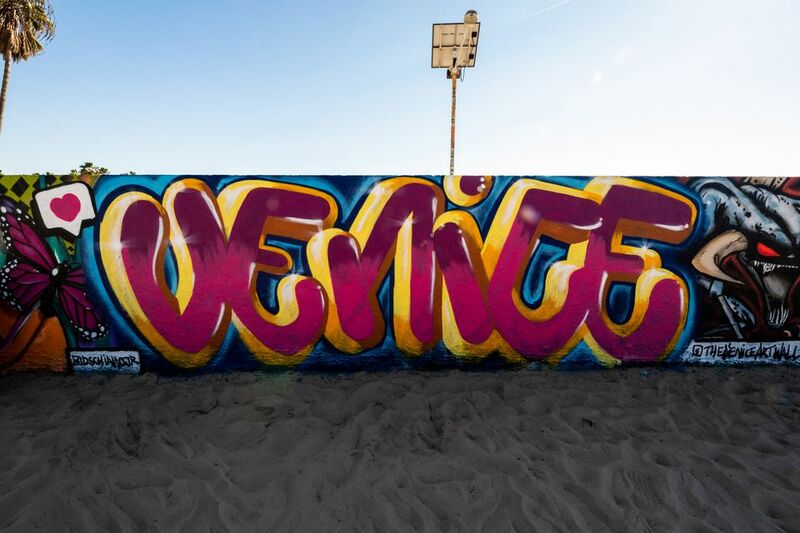 The beach was here long before an idealistic real estate developer dubbed it Venice, but today Venice Beach is both a town and a recreational seashore, one of the funkiest, most varied and fun beach scenes in the Los Angeles area. The ocean's edge is nice in Venice Beach, but it's not the surf and sand that take center stage. Instead, it's the lively sidewalk scene, where you'll find artists, palm readers and bikini-clad roller-skaters mixing with chanting, saffron-clad Hare Krishnas, and wriggling belly dancers. Venice Boardwalk: It's really more of a sidewalk than a "board" walk, but a walk down it is the best way to explore the waterfront scene. You'll pass street performers, skaters, artists, gawkers, and vendors selling all kinds of items from incense to sarongs. Muscle Beach: This is the place where Arnold Schwarzenegger and hosts of other bodybuilders have "bulked up" in the outdoor weight room. If you'd like to have your day in the sun, you can buy a day pass at the office. Venice Canals: A few blocks remain out of some 16 miles of man-made waterways that once graced Venice-of-America, founded in 1905 by local developer Abbot Kinney. You can walk along them in the area bordered by Washington, South Venice Blvd., Pacific Ave. and Ocean Ave.
Venice Beach Graffiti Walls: The graffiti artists who gain permits to paint here exhibit a high quality of artistic flair. They're busy at work on selected weekends. Venice Beach House: The exuberant house at 12541 Beatrice (which faces the waterfront path just north of the Venice Pier) is a must for fans of architect Frank Gehry. Every time we show up with camera in hand, it seems to have been painted a different color scheme, but the basic layout stays the same. Abbot Kinney Blvd: The travel writing press has been touting Abbot Kinney as the newest hip spot for years, but it's just now starting to live up to the hype. It's a few blocks away from the waterfront, but worth a stop for nicer restaurants than you'll find at the beach and for a browse in some of the funky boutique shops selling clothing, home decor items, and other fun stuff. If you photograph the street performers, it's polite to tip them a little. Jody Maroni's Sausage Kingdom is famous for its hot dogs and makes a good place to grab a bite to eat. Walk south of Venice Blvd. to get to the pier and see the quieter side of Venice life and the beachfront lifestyle. In early October, the Los Angeles Triathlon kicks off with a swim in Venice, then the participants take off on Venice Blvd., blocking cross traffic and generally making it hard to get anywhere. Best Time to Visit: Not surprisingly, Venice Beach is busiest in summer, but may be prone to morning and evening fog. To enjoy the crowded hustle-bustle, arrive mid-morning or later on a weekend. Summer weekday afternoons can also be pleasant. The beachfront goes to sleep after dark. From I-405, take Washington Blvd. west. Park on the street if you're lucky, or in one of the public parking lots.